Defeat Hofgrir Horse-Crusher in a brawl. Defeat Hofgrir Horse-Crusher in an unarmed brawl. Meet Holfgrir Horse-Crusher at the Riften Stables, just to the north of Riften. 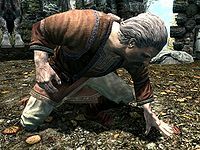 Talk to him about the dangers of living outside the walls, which will lead to him boasting about being the strongest brawler in Skyrim. Make a 100 gold bet with him that you can beat him. This brawl is like any other, and the usual rules apply: no weapons, and no offensive magic. Beware, as he is much tougher than most other brawlers. After winning the brawl, talk to Holfgrir and he will give you your 100 gold back, as well as another 100 gold for winning the bet. Successfully completing this quest results in being able to ride his horses for free. If you don't have 200 gold when you attempt the brawl the quest may be uncompletable. This can be fixed using setstage FreeformRiften19 200 followed by resetquest FreeformRiften19. The following empty quest stages were omitted from the table: 10, 30, 40, 200, 250. On the PC, it is possible to use the console to advance through the quest by entering setstage FreeformRiften19 stage, where stage is the number of the stage you wish to complete. It is not possible to un-complete (i.e. go back) quest stages, but it is possible to clear all stages of the quest using resetquest FreeformRiften19. Esta página foi modificada pela última vez à(s) 02h30min de 2 de outubro de 2014.